UNPO and Mapuche Show Solidarity for the Political Prisoners on Hunger Strike. 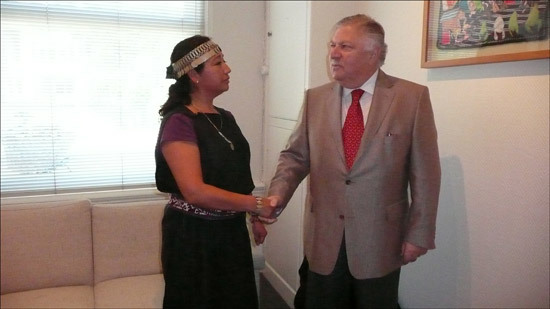 The Hague, 7 June 2011 – The UNPO offered its support on Friday June 3, 2011 to the Mapuche activists who in a show of solidarity, sought to protest Chile’s “abuse of due legal process” at the Chilean Embassy in regards to four members of the Mapuche indigenous community. Hector Llaitul, Ramon Llanquileo, Jose Huenuche and Jonathan Huillical are accused of crimes under the Pinochet-era anti-terrorism law, which allows the Chilean prosecution to use tactics such as anonymous witnesses and calls for harsher sentences than would otherwise be allowed. The political prisoners’ hunger strike, now having lasted over 80 days, is an effort to bring attention to these draconian laws that clearly violate international human rights standards. Representatives from the Mapuche Foundation Folil and supporters from other indigenous groups such as West Papua and Alifuru Maluku, organized to petition the Chilean Ambassador at The Hague to reverse the conviction of the political prisoners (Chile does not recognize the four as political prisoners since 2009 when President Bachelet stated there were no Mapuche political prisoners) and uphold international legal standards. They also sought to bring attention to the living conditions of the Mapuche people in Chile and the discrimination they face. According to the Alifuru and Mapuche representatives quoting the UN Declaration on the Rights of Indigenous Peoples, government investment in the Mapuche people cannot be considered the solution for the problem of land forcibly taken away and must be addressed as a political issue. As of Monday, June 06, 2011, the Chilean government has downgraded the convictions and reduced the sentences of the four Mapuche political prisoners. However, the government subsequently added robbery to the men’s convictions, which continue to depend on anonymous witnesses who were paid for their testimony. The four pledge to continue their hunger strike until their convictions are completely overturned. In a public statement from the Wallmapu Futa trawun (Mapuche Parliament of the Ancestral Territory), the ruling is a sign of Chile’s violations to human rights and Conventions and International Treaties that relate to Indigenous Peoples. The UNPO has repeatedly called for Chile’s ratification of the Indigenous and Tribal Peoples Convention (169) of the International Labor Organization and their upholding of the Chilean Constitution and international human rights standards.